With so many step-in tub options out there, it can be easy to get overwhelmed. At New Bath Walk In Tubs, we not only have high quality walk-in bathtubs, but we have professional installation and excellent customer service. It’s a combination that can’t be beat! That’s why so many Ohio homeowners choose New Bath for their step-in tubs. Without proper installation, a step-in tub can cause a lot of problems for homeowners. Avoid the hassle and mess of an improper installation and call New Bath! All of our walk-in bathtub installers are professionally trained. They know how to install your step-in tub right, on time and on budget. We take the time to make sure your walk-in bathtub is installed properly, and that you are happy with the final product. We are dedicated to helping homeowners regain their bathing independence. A safe, relaxing bathroom is an important part of allowing you to live independently for years to come. High Quality Customer Service for homeowners in the Columbus, Cincinnati, and Cleveland, Ohio areas! Here at New Bath, it’s our mission to not only provide you with a relaxing, spa-like experience in one of our step-in tubs, but also excellent customer service. We can walk you through all of our walk-in bathtub options, and answer any questions through each step of the process. Our representatives can help you pick out the perfect walk-in tub to meet your needs, space and budget. 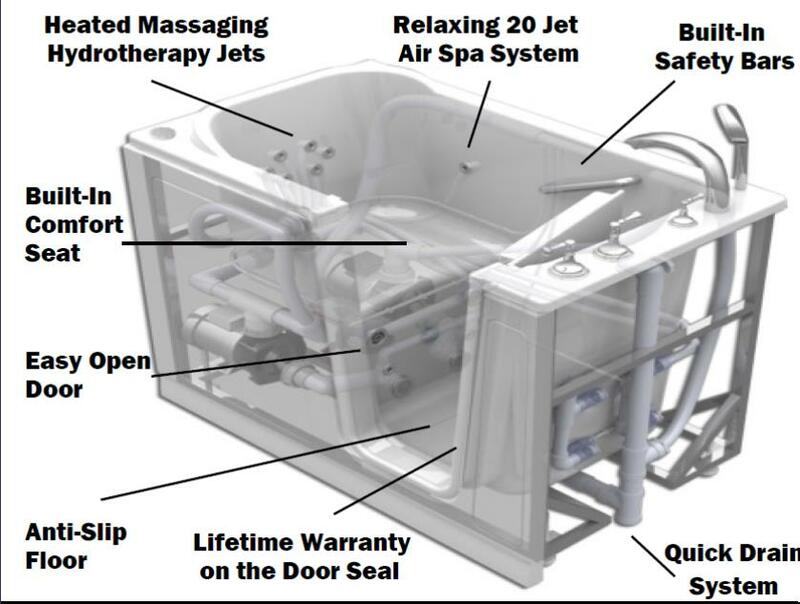 We want you to feel completely confident with your step-in tub purchase, so that you can enjoy independent bathing and our stress relieving features like our water and air jets. We specialize in walk-in bathtubs for Ohio, Georgia, and North and South Carolina homeowners, we know the specific challenges of limited mobility for homeowners in Columbus, Cleveland, Cincinnati, and the surrounding areas. With our step-in tub knowledge, we are confident we can help you regain your bathing independence, quickly, comfortably and with peace of mind. If you or a loved one are growing older, recovering from a surgery or major injury, or simply looking to bring a piece of the spa back to your home our walk-in baths are a great option for independent bathing. See why so many of our customers in Columbus, Cincinnati, Cleveland and throughout Ohio, are satisfied with our walk-in tubs and contact us for a free consultation today!